Now for one of our favourite, Ochro rice. Hi there! It’s been a while but I am still around. The semester is coming to a close soon so you know how the work has really piled up and yuh boy is just busy with assignments. But this too shall pass and things will be back up to speed by the next few weeks. In the mean time, I am still trying to get the recipes posted when I can. Behind the scenes, I’ve been busy still photographing recipes and getting them ready for the site. So look out for some wonderful recipes in the weeks to come. I’m already getting prepared for December and the Christmas recipes so you have that to look forward to also. As always, I’m open to requests and comments so keep the requests and comments coming. I really enjoy reading your comments and email. A while a back you may remember I did a post on split peas rice and mentioned the varieties of mixed rice there are with each one being named after the main ingredient used. Today, I have for you Ochro Rice, with the main ingredient being ochro (okra), mixed together with all the wonderful ingredients and meats. This time we decided to use smoked bone as our meat ,which also gives the pot a distinct smoked ham flavour. Again you can use any type of meat so don’t be discouraged if you see me using any meat you don’t eat. This is a very simple pot to cook, but so tasty. 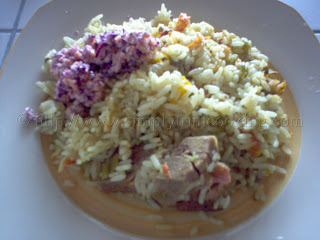 So enjoy ochro rice; another versatile one pot meal. Ochro rice with smoked bone and a side of purple cabbage cole slaw. 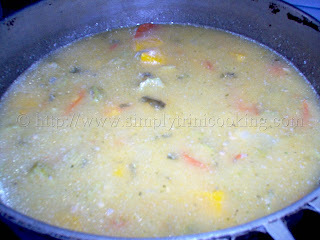 If you are using saltfish boil and remove the bones before adding it to the pot. If you are using pig tail or smoked bone boil or pressure cook it until it is tender before adding to the pot. 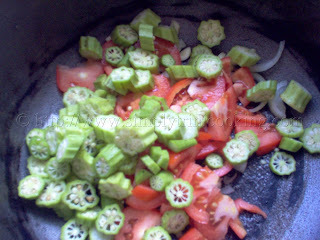 Saute the onion and garlic then add the tomatoes and ochroes. 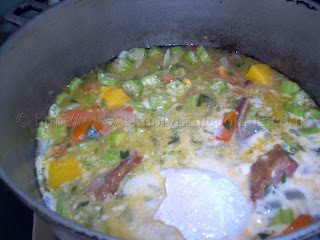 Add the vegetables, the seasonings, meat, water and coconut milk. Cover the pot and allow to simmer. Cook over a medium flame. 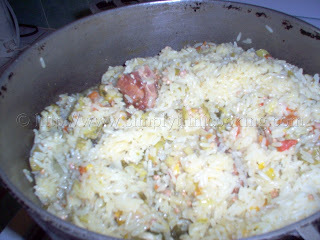 When the ochro and the vegetables are a bit tender (in about 20 minutes) add the rice. Stir the rice to make sure it is well mixed in with the vegetables and the liquid. 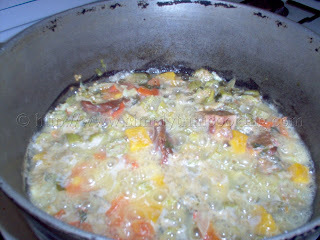 Add some more water, turn the ingredients in the pot and cover to simmer. Every now and then turn the rice to ensure it does not stick. Lower the flame and allow the liquid to evaporate. 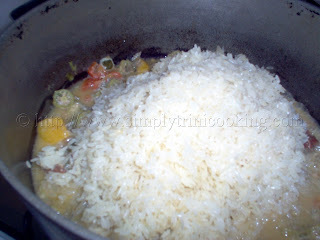 Remove from flame when all of the liquid is absorb and rice is tender. This meal really tasted delicious with the cole slaw and the smoked bone flavour was out of this world…As I said before, this is a very versatile dish and with the different choices of meats and vegetables you could mix and match and have so many variations. And I have not even touched the surface when it comes to the variations. Traditionally though, the meat we use are pig tail and salt fish. Smoked bone, I believe, is relatively new but it is just as tasty so it is safe to say that the meat is us usually some type of cured meat be it smoked, pickled or salted. The vegetables could be any of your choice but when it comes to which one names the dish we usually have bhaji or spinach rice or ochro rice. And then we have the split peas rice as well. Anyway, I have to go now but I will see you soon. Bye! Thank you for posting this recipe. Another request i have, is fried rice. I just enjoy your recipes. I do plan to do fried rice so keep checking my posts. I am happy you enjoy the recipes. Thank you. I’ve heard a lot about this vegetable but I’ve never been quite sure how to cook it. thanks for the recipe, sounds great! I’m making this recipe today and I’m quite excited… The pot looks good so far!!! Tasted amazing with stew chicken. Yum. you no how long i have not eaten this i just finished cook it and i going to sit and enjoy it thank you for this recipe . I want to make this but I am confused. Why are there two sets of chive and celery? Did i miss something? Hope i don’t sound stupid lol. No you didn’t miss anything. Looks like I did lol! 🙂 Just a typo. Fixed now, thanks for alerting me to it. 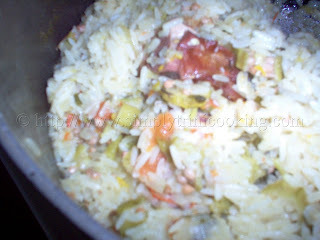 I just made my pot of okra rice following your recipe and it came out fantastic!! I used smoked turkey necks for added flavor. We will be serving this with curry goat today. Thank you so much for sharing this recipe! Can I use coconut milk powder in place of coconut milk? Hi I just feeling for this meal..funny thing I dont eat ochro but I cant help but feel for this..I’m goin to follow your step by step guide. Thanks so much. I tried this and followed your instructions and it was perfect! Thank you darling! Trini food is simply the best! Made this today with smoked pork (thought it was smoked turkey & had no access to saltfish ugh!) It was delicious! I am pregnant and live in an area without any caribbean influence so the tears of joy i cried after eating were real!! I was afraid of over salting so it was a bit under salted – but the flavor is there as I added pimiento peppers when cooking the onion and garlic.